He set his seal of ownership on us, and put his Spirit in our hearts. For those who are led by the Spirit of God are the children of God.The Spirit you received does not make you slaves, so that you live in fear again; rather, the Spirit you received brought about your adoption to sonship. And by him we cry, “Abba, Father.”The Spirit himself testifies with our spirit that we are God’s children. King David spoke several things through the Holy Spirit (Mark 12:36, Acts 1:16, Acts 4:28). Jesus tells His disciples that you should not worry, when you are on trial for the gospel: "Whenever you are arrested and brought to trial, do not worry beforehand about what to say. Just say whatever is given you at the time, for it is not you speaking, but the Holy Spirit." (Mark 13:11, Luke 12:12). For the one whom God has sent speaks the words of God, for God gives the Spirit without limit John 3:34. Gives you Fellowship: May the grace of the Lord Jesus Christ, and the love of God, and the fellowship of the Holy Spirit be with you all 2 Cor 13:14. Leads you: For those who are led by the Spirit of God are the children of God Romans 8:14. Intercedes for you: And he who searches our hearts knows the mind of the Spirit, because the Spirit intercedes for God’s people in accordance with the will of God Romans 8:27. I urge you, brothers and sisters, by our Lord Jesus Christ and by the love of the Spirit, to join me in my struggle by praying to God for me Romans 15:30. You can drive out Demons through Him: But if it is by the Spirit of God that I drive out demons, then the kingdom of God has come upon you Matthew 12:28. You can understand the things from God: This is what we speak, not in words taught us by human wisdom but in words taught by the Spirit, explaining spiritual realities with Spirit-taught words.The person without the Spirit does not accept the things that come from the Spirit of God but considers them foolishness, and cannot understand them because they are discerned only through the Spirit 1 Cor 2:13-14. When He uses you, you give instructions through Him: Until the day he was taken up to heaven, after giving instructions through the Holy Spirit to the apostles he had chosen Acts 1:2. He reveals secrets: Luke 2:26 The Holy Spirit told Simeon he would not die, before He would see the Messiah Luke 2:26. He can lead you to places: Jesus, full of the Holy Spirit, left the Jordan and was led by the Spirit into the wilderness (Luke 4:1) or prevents you from going places: Paul and his companions traveled throughout the region of Phrygia and Galatia, having been kept by the Holy Spirit from preaching the word in the province of Asia Acts 16:16. Fills you with Joy: At that time Jesus, full of joy through the Holy Spirit, said, “I praise you, Father, Lord of heaven and earth, because you have hidden these things from the wise and learned, and revealed them to little children. Yes, Father, for this is what you were pleased to do Luke 10:21; Acts13:52; 1 Thess 1:6. For the kingdom of God is not a matter of eating and drinking, but of righteousness, peace and joy in the Holy Spirit Romans 14:17. Renews you: He saved us, not because of righteous things we had done, but because of his mercy. He saved us through the washing of rebirth and renewal by the Holy Spirit Titus 3:5. But you were washed, you were sanctified, you were justified in the name of the Lord Jesus Christ and by the Spirit of our God 1 Cor 6:11. Makes you a Child of God: Because you are his sons, God sent the Spirit of his Son into our hearts, the Spirit who calls out, “Abba, Father.” Gal 4:6. Gives you power - to be witnesses: But you will receive power when the Holy Spirit comes on you; and you will be my witnesses in Jerusalem, and in all Judea and Samaria, and to the ends of the earth” Acts 1:8. Encourages you: Then the church throughout Judea, Galilee and Samaria enjoyed a time of peace and was strengthened. Living in the fear of the Lord and encouraged by the Holy Spirit, it increased in numbers Acts 9:31. 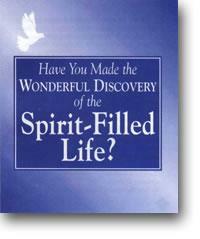 Does Wonders & Miracles: By the power of signs and wonders, through the power of the Spirit of God Romans 15:19. Sanctifies you: He gave me the priestly duty of proclaiming the gospel of God, so that the Gentiles might become an offering acceptable to God, sanctified by the Holy Spirit Romans 15:16; 2 Thess 2:13; 1 Peter 1:2. Gives you Power, Love and self-Discipline: For the Spirit God gave us does not make us timid, but gives us power, love and self-discipline 2 Tim 1:7. Gives you warnings: I only know that in every city the Holy Spirit warns me that prison and hardships are facing me Acts 20:23. Coming over to us, he took Paul’s belt, tied his own hands and feet with it and said, “The Holy Spirit says, ‘In this way the Jewish leaders in Jerusalem will bind the owner of this belt and will hand him over to the Gentiles” Acts 21:11. Makes people overseers: Keep watch over yourselves and all the flock of which the Holy Spirit has made you overseers Acts 20:28. Pours God's love in your heart: And hope does not put us to shame, because God’s love has been poured out into our hearts through the Holy Spirit, who has been given to us Romans 5:5. I urge you, brothers and sisters, by our Lord Jesus Christ and by the love of the Spirit, to join me in my struggle by praying to God for me Romans 15:30. Gives you knowledge, wisdom and understanding: For this reason, since the day we heard about you, we have not stopped praying for you. We continually ask God to fill you with the knowledge of his will through all the wisdom and understanding that the Spirit gives Col 1:9; 1 Cor 12:8. Do not grieve the Holy Spirit of God Eph 4:30. Do not quench the Spirit, 1Thess 5:19. King David poured out His confession to God, after his sin with Bethsheba. he prayed to God: Don't take Your Holy Spirit from me (Psalm 51:11). Throughout the Bible we see people who grieve the Holy Spirit by their rebellion (Isaiah 63:10), lie against the Holy Spirit (Acts 3:5); resist the Holy Spirit (Acts 7:51). The warning is clear: Don't start with the Spirit and then finish by means of the flesh (Galatians 3:3). Don't harden your heart, like the Pharisees: When the Pharisees accused Jesus of having a demon, and therefore be able to perform miracles, Jesus answered: "Anyone who speaks a word against the Son of Man will be forgiven, but anyone who speaks/blasphemes against the Holy Spirit will not be forgiven" (Matthew 12:32, Mark 3:29, Luke 12:10). The Bible says: "Be filled with the Holy Spirit"
In Acts 2:38 Peter states: “Repent and be baptized, every one of you, in the name of Jesus Christ for the forgiveness of your sins. And you will receive the gift of the Holy Spirit." John the baptist has said in several gospels: I baptize you with water, but He who comes, will baptize you with the Holy Spirit. (Matthew 3:11; Mark 1:8; Luke 3:16, Acts 1:5). This was fullfilled at Pentecost: All of them were filled with the Holy Spirit and began to speak in other tongues as the Spirit enabled them. Acts 2:4. In the book of Acts, there are also some believers mentioned that did not receive the filling of the Spirit: “Did you receive the Holy Spirit when you believed?” They answered, “No, we have not even heard that there is a Holy Spirit.” Acts 19:2.